Hiermit melde ich mich für „Artist Training for Professionals FILM I” an. Ich möchte den E-Mail-Newsletter des UdK Berlin Career College erhalten. Die mit * vermerkten Formularfelder müssen ausgefüllt werden. 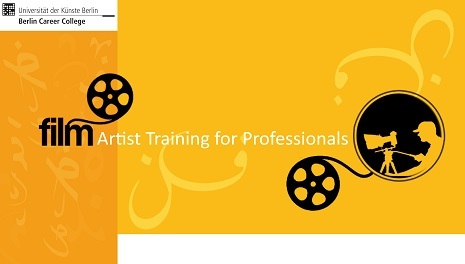 The project “Artist Training for Professionals” is funded by the European Social Fund (ESF). For participation a registration is necessary which will take place on Mondays at 1 am (Bundesallee 1-12,10719 Berlin) before each course. We issue official confirmations of participation of the Berlin Career College upon successful completion of the respective course. The project addresses only to professional artists in exile who live in Berlin and is free of charge. The Berlin Career College focuses on the Continuing Education of the University of the Arts Berlin and offers a variety of courses and classes for creatives. The University of the Arts Berlin is one of the biggest universities of the arts in Europe and the only one to cover the full spectrum of artistic disciplines and related academic or scientific fields. More than 40 artistic, artistic-scientific and artistic-pedagogic study courses are offered at the four colleges of Fine Art, Design, Music and Performing Arts as well as at the Central Institute of Continuing Education. Approximately one fifth of the 4,000 students come from abroad. The UdK Berlin makes a definitive contribution to the city’s cultural life with more than 600 events each year.